As the nights draw in and temperatures drop I have favourite places to be. I’m an outdoorsy type at heart, but hunkering down in a cosy chair in front of a roaring fire is pretty high on my list of priorities at this time of year and one of my very favourites is at The Bildeston Crown. Nestled almost at the centre of the triangular space between Ipswich, Sudbury and Stowmarket, Bildeston is perfectly positioned for exploring the historic Suffolk wool towns and chocolate box villages like Kersey and Chelsworth but quite frankly, once you’ve checked in at The Crown it’s unlikely you’ll want to leave. It’s a clever chameleon of a hotel too – one of those places that manages to mould to your needs, matching moods and expectations effortlessly. 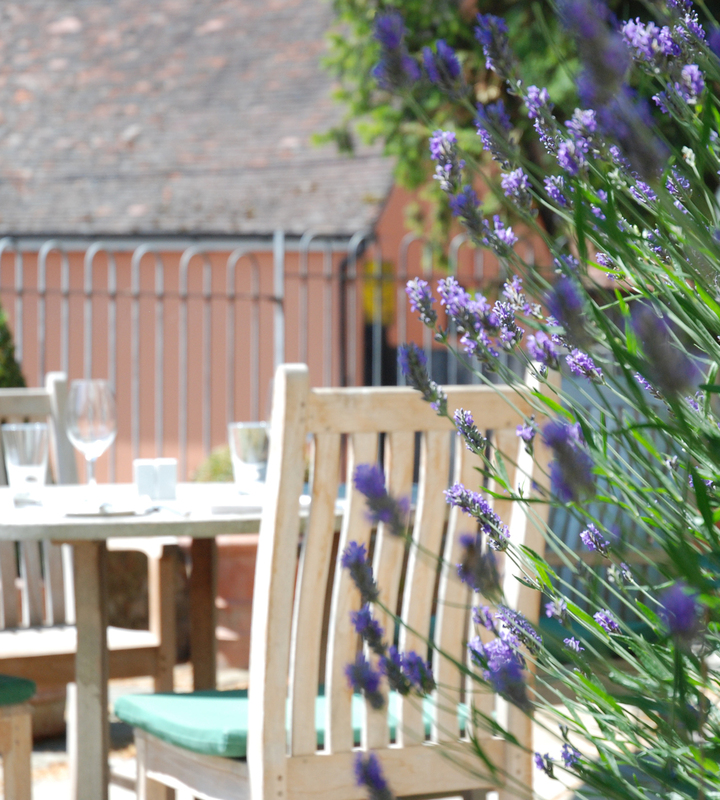 With past visits we’ve enjoyed the white table clothed elegant dining experience that is ‘Ingrams’, complete with private lounge and terrace, and perfect for a special celebration. On another occasion the more relaxed but equally impressive brasserie was our choice however, for this mid-week stay-over, we were in the mood for something even easier. Arriving on a wet October evening after a long day in the office, complete with our trusty Golden Retriever Darcy in tow, we were looking forward to an evening to just ‘chill’. 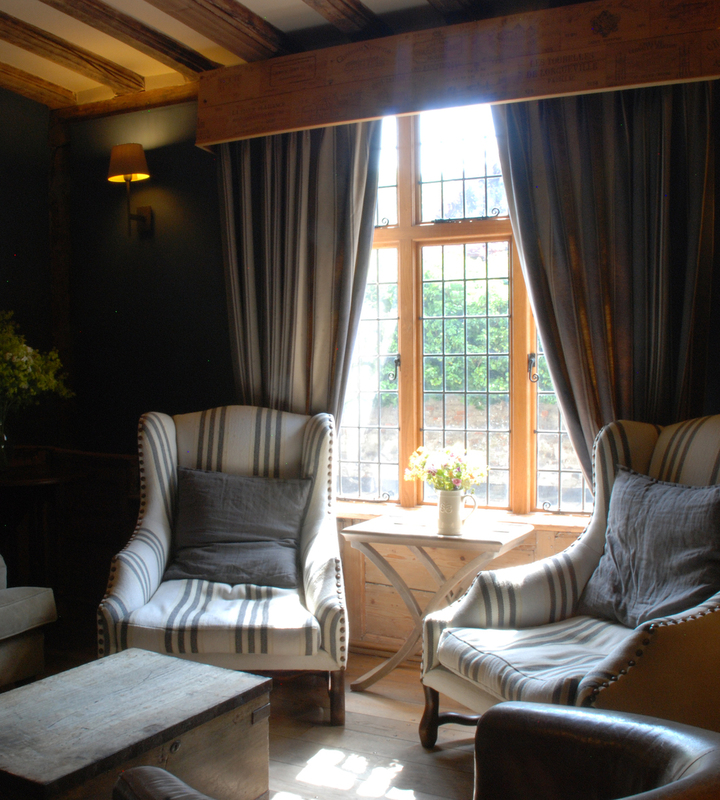 The building was originally a 15th Century coaching inn and over time has been carefully renovated and refurbished to provide a comfortable and stylish base while retaining all the character of exposed beams and enormous open fireplaces. 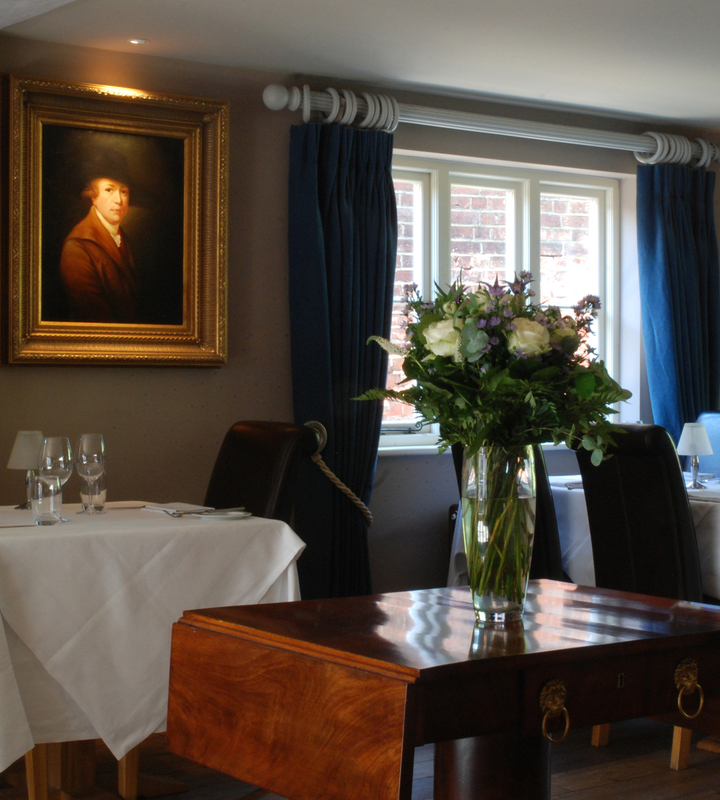 Recent redecoration has seen the classical influence of General Manager Alice Gibbons come to the fore and you just feel yourself being drawn in by the deep, inky tones used throughout the reception areas and bar. I’m completely in love with the bespoke hand decorated walls by Adam Calkin; the murals are calm but colourful and have added another dimension to a space that quietly beckons you to stay, relax, unwind. With nothing to do but install ourselves in the perfectly positioned leather wing-backs in front of the fire I could feel the ever present mental ‘to-do list’ temporarily file itself away for the evening while we placed ourselves in the safe hands of the team at The Crown. I don’t know how they do it but they never fail to impress. Friendly but not intrusive, attentive but not interfering, perfectly courteous but not sycophantic – the staff at the Bildeston Crown have good measure of what good service feels like. We’d reserved a table in the bar and so as Darcy slept at our feet, clearly settled, it was time to take a look at the menu. I mentioned that malleability, that willingness to ‘be’ what the customer needs - well it’s a value that’s well illustrated with the restaurant and bar menu. Seven out of the nine starters on offer could also be ordered as a main course dish. That’s the kind of thinking that fills me with joy. It means I can eat a meal that suits me. So often, particularly at a lunch time, or maybe for a lighter supper, I fancy a starter-style dish but as a stand-alone meal and here there’s plenty of choice. Mind you – on this occasion I was in more of a ‘glass of red and a casserole’ type mood - it was probably still at least 15o outside but the rain and wind had me in winter eating mode. Salmon and coriander fish cake caught my eye straight away. Served with creamy spinach and salad the dish had ‘comforting starter’ written all over it. I was almost swayed by the langoustine and smoked prawn platter and if my husband (Adrian) hadn’t chosen the garlic butter snails with French baguette I could have been tempted to go for them too - but he’s a generous diner and always willing to share. Both dishes were superb; the subtle flavours of the fish cake were well matched with the creamy spinach whereas the snails packed incredible garlic punch that stood strongly alone with the simple freshly baked bread to accompany. On to mains and beef Bourguignon was an easy choice given my previously mentioned mind-set. The lovely twist with this dish is that it’s cleverly served with the rich casserole in an earthenware dish and accompanied by an individually sized copper saucepan, complete with lid to keeps the mashed potatoes lovely and hot. The tiny button mushrooms melted in the mouth along with the beautifully braised beef in its rich gravy. Adrian’s choice was a little more difficult to make. Burgers are always tempting as a bar meal and with the option for stilton or Suffolk gold cheese within I could see his mental ‘taste versus calories’ calculator going into overdrive. If I were a betting girl I’d have put money on his choosing bouillabaisse with saffron potatoes or maybe even rack of Nedging lamb in parsley crumb but instead he ordered the 9oz Red Poll rib eye steak. Complete with Béarnaise sauce it was indeed another triumph, well presented and perfectly cooked to order. Tempting as the desserts sounded – poached pear and cinnamon crème Brulee, chocolate fondant or rum and raisin soufflé in particular – we were pleasantly full and returned to the fireside to finish our wine before retiring for the evening. Now at this point I generally segue to breakfast but - not so fast. The rooms at the Bildeston Crown each have an individual style and are all furnished and finished, exactly as you’d expect, to the highest of standards. Our room was warm, welcoming and luxurious with a stunning bathroom complete with double ended bath and indulgent rainfall shower. But above all of this I must mention the bed; simply huge. If you’re lucky enough to spend your nights in an oversized bed on a regular basis then you’ll certainly feel at home however if, like me, a regular double is the norm then you’ll probably revel – as I did – in being able to adopt the starfish position without annoying your partner! Luxury comes in all shapes and sizes and that was one big box ticked for me. Rested and refreshed we were thoughtfully shown to a breakfast table that had been especially reserved for us in the bar rather than the restaurant – so that Darcy could accompany us. This was a lovely touch, we hadn’t had to think of it for ourselves in advance and check that it would be OK, again the team were a reliable step ahead. As with our evening meal the breakfast was faultless. Great Suffolk ingredients for the cooked English options as well as a good choice of continental meats and pastries – did we really have to leave? I could have stayed. A bracing walk with Darcy and then back to the fireside with a good book or a game of Scrabble and I’d have been in my element but not to be this time. A treat to be revisited, and soon I hope.